Roll up your sleeves. If you'd like to build your own log home from scratch, these construction guides and building plans will tell you how. Packed with floor plans, diagrams, and step-by-step instructions, the titles by these expert authors give the technical information you'll need to design and construct a log cabin that expresses your style and personality — without using a ready-to-assemble mail order kit. 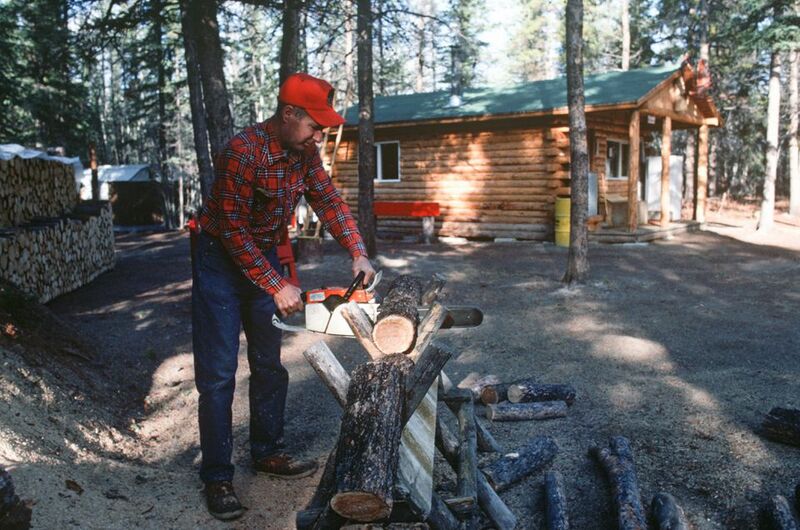 His 1997 book Building with Logs gave just enough technical information to build a simple cabin from start to finish. This 2011 book by B. Allan Mackie continues documenting the methods taught at the B. Allan Mackie School of Log building and in his video training series. Over the years, Mackie has honed his talents and teaching methods, leaving his students rich in knowledge and the world better with well-built log houses. Mackie, a founding member of what became the International Log Builders' Association, showed the world that owner-built log homes may be the key to longevity, as he was age 92 when he passed away in 2017. Authors Clyde and Jeffrey Cremer have written a tell-all book, aptly subtitled "How to Buy, Build, and Maintain Your Dream Home." After earning a Master of Forestry degree from the Yale School of Forestry & Environmental Studies, Clyde founded American Log Homes in 1977. With a Master of Science in Construction Management, Jeff Cremer helps his Dad help people with basic materials and how to assemble them. What more could you ask for? The name of author Jim Cooper keeps appearing when you listen to people who are looking for useful guides. This 2008 book, subtitled "Contracting and Building Your Own Log Home," is in its 3rd edition, which proves its popularity. Some say that newer editions aren't so different from earlier ones, so look for Cooper's book at the library sale table or used bookstore if you just want to take a look at how it's done. "Move over, Abe Lincoln," begins this 2004 book. "America is moving in!" Authors Cindy Teipner Thiede and Heather Mehra-Pederson have gathered thirty favorite log home plans from builders across the United States. Each floor plan is illustrated by color photographs of interior and exterior views. This is the place to begin if you want variety — plans range from tiny cabins to grand estates. Fifteen plans by contractor/author Robbin Obomsawin give basic guidelines for building a "storybook" cabin. At less than 2,500 square feet, these log homes are cozy and romantic, yet have a sense of spaciousness. First published in 1939 and updated in 1974, this little classic by W. Ben Hunt (1888-1970) uses simple diagrams to illustrate the original, pioneer methods for building log homes. Hunt, who grew up in a Wisconsin log cabin, also gives step-by-step instructions for making log furniture — an art learned in part by studying the furnishings of Native American craftsmen. Whether you are using a kit or building from scratch, this old 1985 manual by Roger Hard will give you the technical details you need to select a site, choose materials, and launch construction. The book includes building plans for a 24' x 40' hillside cabin. Use it as a guide, or as inspiration for your own designs. Robert Wood Chambers has written in 272 pages what he calls "The Ultimate Guide to Building Handcrafted Log Homes." This 2002 book published by Deep Stream Press is one in a series of Chambers publications and DVD training videos. If you're serious about building your own log home, get some help from the International Log Builders Association at www.logassociation.org/. They have conferences, forums, and useful publications like this 2010 book on effective practices and methods. Subtitled "An Insider's Guide to Making Your Dream Home a Reality," this 2010 book by the late Roland Sweet is a great companion to the magazine he helped found in 1989, Log Home Living. Sweet also authored 100 Best Log Home Floor Plans in 2007, mentored writers, editors, and builders, and died too young at age 69 in 2015. Of the two well-known schools of log building, the Pat Wolfe Log Building School rivals Mackie's School of Log building. Wolfe's European methods have been passed on to generations of his students, including author Dalibor Houdek. The focus of this 2010 book is in the subtitle, "From Log Shell to Finished Home." How do you finish a log home? Houdek shows you how.